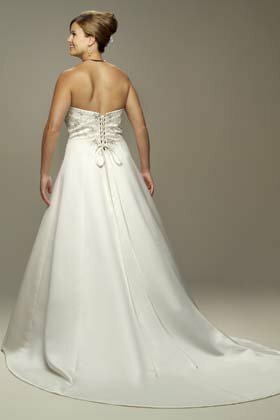 Strapless wedding dress with a bodice embellished with silver beading and embroidery. Soft pleating at the waist. Beading pattern is continued down the length of the A-line skirt (mock wrapover). Beautiful lacing at back (with or without panel behind lacing.) There are also optional 1" wide straps. The skirt comes with built in nets and has a train. Before you buy please check your measurements with a tape measure against the size chart. This dress is for a bust 39.5", waist 31.5" and hips 43". There is scope for letting this dress out by about 2"